RSU 21’s public Pre K program will serve all children in Kennebunk, Kennebunkport and Arundel who are turning 4 before October 15th. Students turning 5 before or on October 15th will not be eligible, as they are kindergarten age. Who will a public Pre K program serve? Where will the public Pre K program be located? The public Pre K program will be housed at Kennebunk Elementary School for students from all three towns. There is not space for a program in all three schools. Additionally, it will benefit the teachers in this new program to be in close proximity for professional collaboration and support. Each classroom will be a full-sized classroom at KES with a bathroom in it. These classrooms are 800-1,000 square feet with large bright windows. 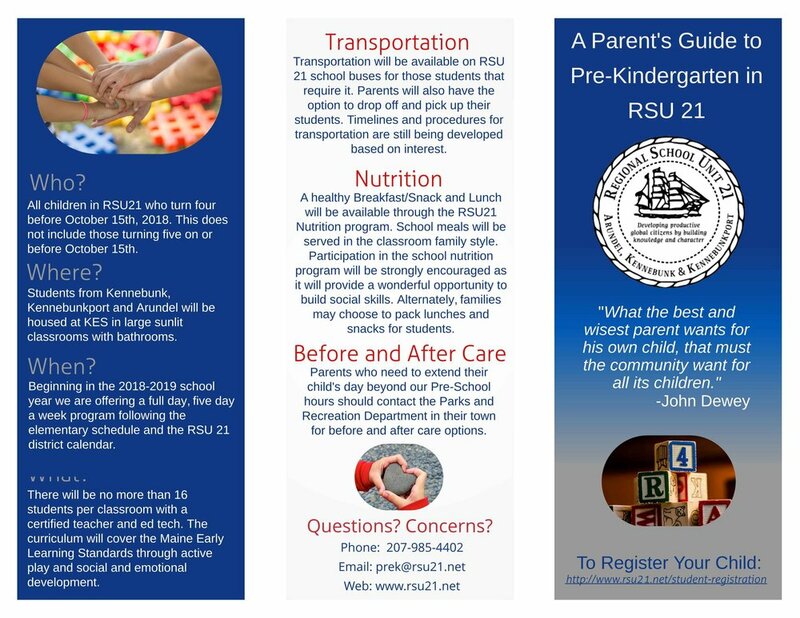 When can my child attend RSU 21’s public Pre K program? Beginning in the 2018-2019 school year we are offering a full-day, full-week program, that will follow the elementary school schedule and the RSU 21 district calendar. Parents will have the option to pick students up after lunch if needed. Here, you can complete almost all of the necessary forms online. You will still need to bring proof of residency, a health update form, and immunization record from your child’s physician to the RSU 21 Main Office at KES at your earliest convenience. I have registered my child, what will happen next? You and your child will be invited to an Open House and Screening day during the first two RSU 21 school days. At this time, children will participate in a basic readiness screening to help teachers get to know them better. Parents will have the opportunity to see the classrooms and ask teachers and administrators any lingering questions. School will start for Pre K students on the third day of the RSU 21 calendar, alongside kindergarten students. What will the Pre K program look like? The program will encourage whole child development through active play and thematic units. It will be staffed by one teacher and one educational technician. All of the teachers will hold Maine Early Childhood Teacher certification and will have experience with this age level. A Pre K Director will oversee this new team and help communicate with parents. The program will focus on Maine’s Early Learning and Development Standards. 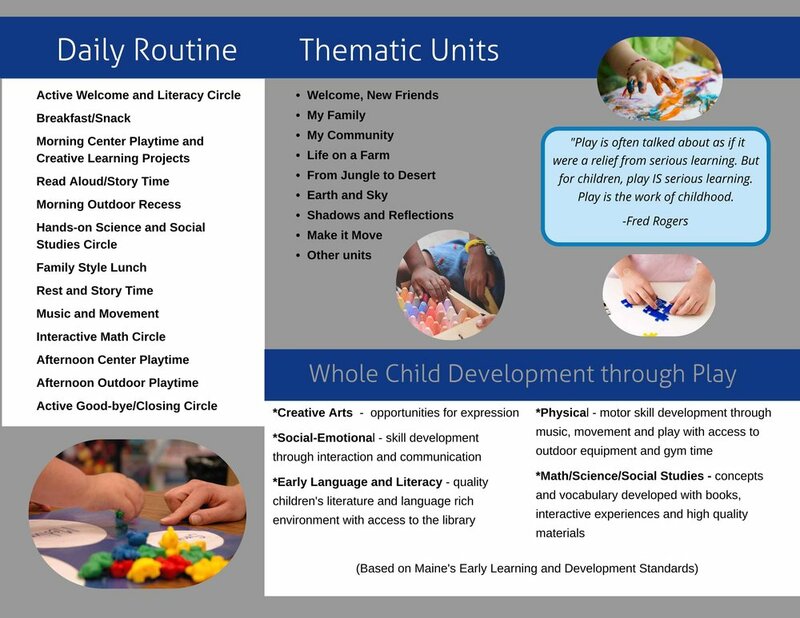 Although Pre K students will not attend Allied Arts classes, the teachers will integrate the arts, music, and physical education skills into the daily classroom routines. Classes will be able to access shared spaces at KES including the library, gathering area and gym. What will the Pre K daily schedule look like? While each teaching team will adjust the schedule to meet their needs and the availability of shared spaces like the playground and library, all of the Pre K classes will include the same basic routines daily. Transportation will be available on RSU 21 school buses for those students that require it. Parents will also have the option to drop off and pick up their students. Timelines and procedures for transportation are still being developed based on interest. A healthy breakfast/snack and lunch will be available for purchase through the RSU 21 Nutrition Program. School meals will be served in the classroom family-style. Participation in the school nutrition program is strongly recommended, as it will provide opportunities for social skill development. Alternately, families may choose to pack lunches and snacks for students. Will there be before and after care? Parents who need to extend their child’s day should contact the Parks and Recreation Department in their town. Transportation of students to and from their hometown schools for before and after care will be available through RSU 21. What health and medical information will I need to provide about my child? Do Pre K students need to be toilet trained? While we highly encourage parents to work on toilet training prior to enrollment, it is not a requirement to enter the program. How is this program being funded? Funding for the program will flow through the state funding formula that has been in place since 2005. This formula typically has a two-year delay in receiving funds as the state essentially reimburses the district based upon actual child attendance. However, this year the state adapted their funding formula to encourage development of Pre K programs by providing upfront funding for Pre K based upon projected numbers. Our projections have been submitted and the state funding will more than cover the expense of the program. While the state funding formula for PreK-12 education is never a guarantee and is always dependent upon the nuances of the state budget, we do not anticipate changes to this part of the formula.This annual funding structure will remain in place each year allowing us to implement this new program with no direct effect on the taxpayers. Is RSU 21 one of the first school districts to provide public Pre K? Not at all. In fact, approximately 75% of all public school districts in Maine currently offer a public Pre K option. In York County, 13 of the 16 districts already offer a public Pre K.
In March of 2017, RSU 21 convened a public Pre K Committee. This group of parents, teachers, administrators, board members and community members held monthly meetings which were open to the public. The committee explored the research and investigated different models for public Pre K. They also visited an number of school districts with varied public Pre K models. The committee sought parent input through a survey. The survey was taken by 431 respondents. Of that number, 96% supported the development of public Pre K in RSU 21. A Community Provider Forum was held in October 2017. The local child care providers that attended voiced positive input for the development of this program. A proposal was presented at a school board workshop in November, 2017. The workshop was well attended and garnered public input from parents, local child care providers, teachers, community members, and administrators. The school board approved the implementation of a universal public Pre K on December 18, 2017. A task force is now working hard on the logistics of a quality of public Pre K program in RSU 21. Please contact Superintendent Katie Hawes or email Ellen Towne with further questions.